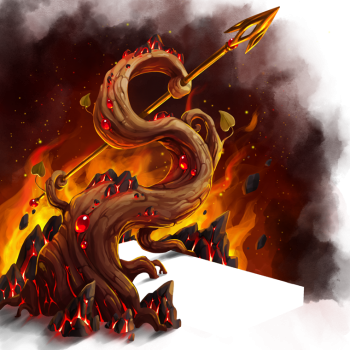 A mighty Ember Root grows atop a bed of blazing Ember Stone. Poised with a Golden Spear forged from the leaves meticulously hand-plucked from several seasons of Ember Root growth, this mighty root heats the spear to 1 degree below its melting point before hurling it with unmeasurable speed towards its target. Only the finest leaves are picked to be wrapped and hammered in order to fulfill each spear's dragon-destroying destiny. A complete list of all Draconic weapons can be found here. 26 June 2018: Blazing Ember Spear Trap was released with the introduction of Queso Canyon. This page was last edited on 12 January 2019, at 12:25.